The Gee Gees uses are fairly standard three reel, single line format and comes in coin sizes ranging from 10p to £10. 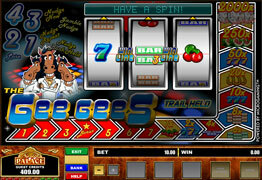 70ies Disco style and concerts are the theme of this fruit machine. With a bonus stage that is activated every time you get a three symbol win (which is naturally very often), the Gee Gees offers a very entertaining format plus the chance of some impressive jackpots. Line up disco balls, watermelons, sevens and the Gee Gees, of course, for wins up to 2000 times your bet – both on the reels and in the bonus game. The highest win can be up to a staggering £20,000!